The only thing older than the protagonists in Last Vegas are the jokes that the film’s makers come up with. This predictable comedy about four seniors who head to Sin City for one memorable weekend has a moldy, formulaic feel to it, what with all the repeated references to hip surgeries and hemorrhoids and Viagra. But the veteran stars appear to be having a good time, and their laughter is slowly contagious. I am going with two-and-a-half out of five for Last Vegas. Good actors can improve mediocre material; this film is evidence of that. Watch it to unwind after a long day at work. Last Vegas offers a sensitive look at the difficulties of old age and the vicissitudes of friendship that spans decades. Beneath the surface, it makes you think about the relationships in your life. How lasting are they? On what foundations are they built? And most importantly, will they stand the test of time? We also find out the real reason why Paddy and Billy have issues. Overall, the feel of the movie is relaxed and Turteltaub does a good job of breaking the mould of onscreen senior citizen stereotypes. This Old Boy’s Club still knows how to party! Note: You may not like this film if you don’t enjoy movies about friendship from a senior citizen perspective. Last Vegas is a one-time watch on a Sunday afternoon when you’re half asleep and all else on television includes a screaming news anchor and reruns of saas-bahu shows. It lacks charm or mystery. It might be perfectly executed with an amazing star cast but it lacks a soul — and a story.Last Vegas could have explored its central theme better and focused more on the victory of the immortal human spirit over the mortal human body. But the film chose to go another way. After watching Last Vegas, I wish what had happened in Vegas stayed there. This is lazy writing for a Hollywood movie with four legendary actors and they deserve better than this, as do the audience. None of the jokes are funny as such and none of the sentimental moments are moving in any way. Theoretically it should be very easy to be able to relate with these characters and sympathise with them, but when the likes of De Niro, Douglas, Freeman and Kline fail to render any emotion within you it’s time to leave the hall and watch their earlier films on DVD. Though the movie wants to deal with some serious issues like old age, loneliness, and the value of meaningful relationships, none of them have been offered enough space in the script, hence not letting the issues be connected and felt by the audiences. Don’t be surprised or disappointed if you don’t find an emotionally-engaging movie experience with Last Vegas. It is a lot of naughtiness but shown in the most-subtle form. 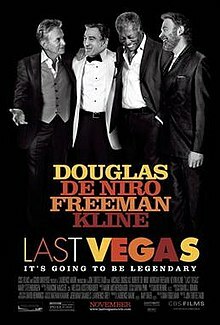 If you crossed “The Hangover” with “The Bucket List,” you might wind up with something like “Last Vegas.” For all I know, that may have been the exact pitch that brought a green light to this almost defiantly pointless film, competently directed by Jon Turteltaub. A mild geezer comedy full of jokes that might have sounded tired at a “Dean Martin Celebrity Roast,” the movie has no reason for existence and nothing much to recommend it.